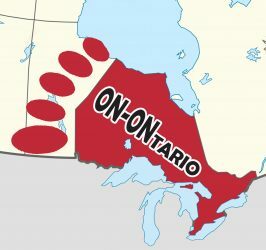 ON-ONtario – The Provincial Affair!!! Welcome to our ON-ONtario Interhash Campout site! We’re pleased to announce our third ever Provincial Affair weekend will take place Sept 20-22, 2019. Join in the fun on the sunbaked, sandy shores of beautiful Georgian Bay! 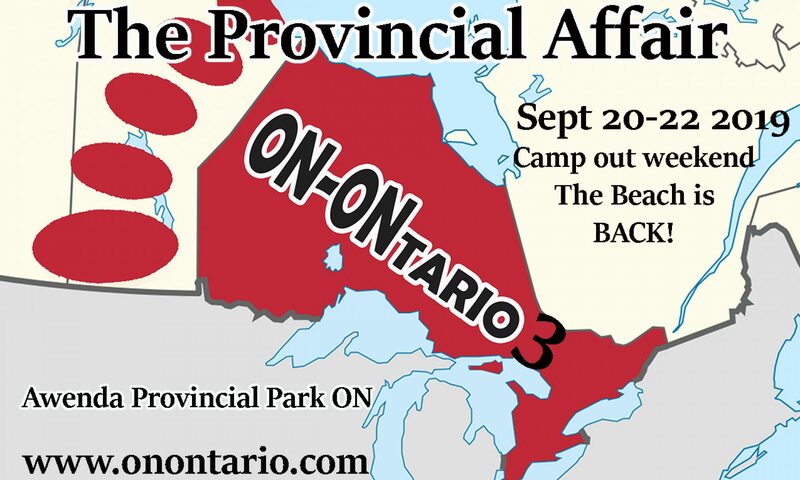 ON-ONtario 3, the Provincial Affair returns as the Beach is Back!!! Join us as Half-Minds from all over the Province and beyond, gather for three (to five) days of Hashing fun and camping in central Ontario’s magnificent Awenda Provincial Park. Highlights of the weekend include Thursdays historic trail past a 400 year old Indian Village, Fridays Awenda Park camp crawl, Saturdays Red Dress Run through beautiful downtown Midland followed by Saturday’s afternoon at the Beach and evenings’ Shooting Star walk, this all culminates with the weekend’s highlight, Sunday’s Serendipity Boat Cruise through the 30,000 Islands with stop to hash on Beausoleil Island, one of Canada’s most bio-diverse National Parks, then a Beer Check stop in Honey Harbour before returning to port in Penetanguishene. The fun continues Monday as the (local Kennel of) Huronia Hash House Harriers host the Post-Lube through the dunes on sandy Balm Beach. Spaces are limited, sign up today! Spaces are limited, sign up today! Reserve your space now. 9 p.m. Night of the Shooting Stars. Yes it is back, the ON-ONtario special, find out what shooters the visiting kennels can create to wreck your body and mind before the big run on Saturday. 8 a.m. -10 a.m. Breakfast & Morning at the Beach. Wake up, stretch out and get food and caffeinated drink into your body before the main run. Circle up and prepare for the ultimate shiggy run. The easy walking trail will be sent off with directions of turn right wherever possible. The adventurous walkers will be sent off first to solve the preliminary checks for the runners that will be hot on their heels. All trails include two timed beer checks, unfortunately the beer keg must keep up with the front running bastards. 11:00 p.m. Buses/cars leave Swimming Hole. 9:00am Buses leave Awenda for Penetanguishene Town Dock 9:30am board Serendipity Princess at Penetanguishene Town Dock Breakfast served on board 10:45am Beausoleil Island Fat Boy walk or Harrier Run 11:45am return to Serendipity Princess 12:00pm depart for Penetanguishene Harbour 1:00pm Lunch at Flynn’s Irish Pub 2:00pm On On Life’s A Beach afternoon ~ Messiah’s Cave, Thunder Bay Beach (Park at St. Florence’s Church, Thunder Bay Beach then walk following the signs past Tennis Courts). ON-ONtario Deux: Pussyfoot sets Epic Trail!!! ON-ONtario Deux returns with a vengeance as host and hare, Pussyfoot sets an epic trail through the Ontario lake land wilderness. The Pre-Lube for ON-ONtario Deux will begin in beautiful downtown Marmora, through a backdrop of Classic Cruiser Cars! Register Now, limited campsites available. ON-ONtario Deux, the second annual Provincial Affair!!! Join us as Half-Minds from all over the Province and beyond, gather for three (to five) days of Hashing fun and camping in central Ontario’s magnificent Marmora Highlands area. Highlights of the weekend include Thursdays Historic and Classic Cruiser Car Show, Fridays Night of the Shooting Stars trail and camp crawl, Saturdays day at the Swimming Hole. This all culminates with the weekend’s highlight, Sunday’s Fat Boy Walk with secret Beer Check before returning to Camp in Marmora. The fun continues Monday as the local Winery tour through the Marmora countryside. Don’t miss out on the fun. Spaces are limited, sign up today! Register here!